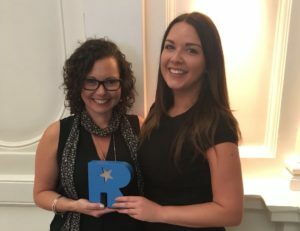 On Tuesday 22nd May, we were delighted to win the prestigious Best Legal Service For Recruitment Award at the annual Recruitment Industry Suppliers Awards. The awards ceremony was held at the Andaz Hotel London and was attended by 110 suppliers to the recruitment industry. Suppliers and clients came together for a second year running to celebrate the great work they do supporting the recruitment industry. The awards are not judged by a panel of individuals but by a survey of the Entrants’ own clients to score the entrants across a number of categories from Best Accountancy Firm to Best Technology Solution making them particularly significant to the supply of services to the recruitment industry. We were up against three other very well respected laws firms in the category, and feel rightfully delighted in bringing home the award. We were joined by 11 other winners on the day, all awarded for providing the best in their service for the recruitment industry. Suffice to say we all shared a few drinks in the bar afterwards! Here’s what your employer doesn’t want you to know about your settlement agreement offer!